The Chin Family, fled the terror of the wars during the troubled era of Indo-China. They went to the refugee camp in Vietnam about 1980. Thankfully, Thuc Lan Tran, has a sister who lived in New Zealand, sponsored the family over as a family reunion. And they arrived in 1990 to have a new lease of life, learning a new language, adapting themselves to a new culture, they all worked very hard, and eventually decided to venture into restaurant business. 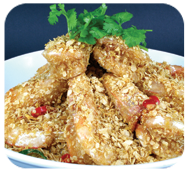 Led by Han Chin (known by most as Han), the eldest son of Lenh Phong Chin and Thuc Lan Tran, together with his parents and siblings Leslie, San Chin (known by most as San) and Jessica, the Chin Family started Hansan Vietnamese Restaurant at Panmure in 1999. And as it turned out, this was going to be the cornerstone of their chain of restaurants. They opened a branch of the Hansan Vietnamese Restaurant in Nuffield Street at Newmarket in 2006, and this was followed by another Hansan Vietnamese Restaurant at Glenfield, owned by a franchisee, in 2007. Then in 2008, another opportunity came along. A friend of Han came to know of a Malaysian restaurant at 22 Torrens Road in East Tamaki, up for sale, told Han about it. Though The Chin Family have not been to Malaysia at that time, they love the food from the region. Han make a quick decision to buy the restaurant, retained its name, Sri Mahkota, and their venture into the restaurant business widened. The restaurant was renovated and kitchen upgraded, however, due to its popularity, some coming from as far as North Shore, and the size of the premise, customers are often left queuing for seats, customers demand for another restaurant to be opened. Thus, Sri Mahkota Restaurant at 164A Great South Road in Epsom, was added in 2009 to cope with the demand is being managed by Leslie and Alan. In the following year, 2010, yet another Sri Mahkota Restaurant was added into their chain of restaurants at 207 Symonds Street in Auckland City, which is managed by Denis and Hean. Mahkota means 揅rown?in English. And this restaurant certainly deserves its name. Sri Mahkota serves a variety of Malaysian Cuisines. Beef, chicken, pork, fish, prawns, squid and vegetables cooked in different Malaysian styles ?deep fried, curry, assam, rendang and sambal are just some examples. 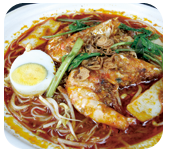 Some of the popular Malaysian noodle dishes are Wat Tan Hor, Char Kuay Teow, Curry Laksa, and not forgetting their famous and most popular of the lot, Fish Noodle Soup. And if you prefer rice, then there is the Hainanese Chicken Rice, Bak Kut Teh, Combination Fried Rice, Curry Chicken Rice, and, of course, also the Nasi Lemak.